You’re looking for the best IELTS books out there. There are plenty of IELTS books out there but they’re not all useful or up to date. We’ve picked our favorites and wrote a brief summary about what makes each great. Passing the IELTS important. The required IELTS test score varies by school. Generally, a score band of 6 or above is satisfactory for undergraduate studies. A band of 6.5 is required for postgraduate courses. Some courses and schools may need as high as 8 though. But don’t panic. With the right preparation you can approach the exam with confidence. But because you’ll be spending a good amount of time studying it’s critical you get the right advice. 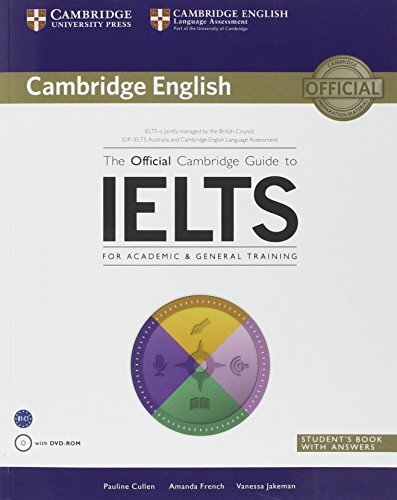 The Official Cambridge Guide to IELTS is written by the makers of the IELTS. The book’s built around a neat concept. Cambridge knows where students find difficulty in English. How? They analyze actual test takers responses. Cambridge English uses this information to identify what test takers need to know most. The guide covers all four skills of the test. Listening, Reading, Writing, and Speaking. Each of the section’s is divided into eight smaller units. With each unit focusing on a specific skill. Harder sections for test takers are given extra attention. The guide also includes eight full length official IELTS practice tests. These questions are of the same difficulty you’ll see on your test day. The answer explanations are easy to understand. They do a great job at dissecting questions apart too. The accompanying DVD includes various audio tracks and speaking test videos. It helps tie all the material together. This is one of our top recommendations as the official guide is the only source for official IELTS questions. Barron’s Superpack offers three manuals to tackle the IELTS. There’s an IETLS manual with two audio CDs. A sample IELTS practice exam with an extra two audio CDs. And a guide reviewing the essential words for the IELTS. The IELTS manual offers a thorough overview of the exam. There’s review for each section of the test. Baron also presents many useful strategies and tips to help conquer various question types. There are plenty of sample exercises for you to work on too. The big difference between this and other prep books is the essential words manual. It helps understand word usage. And it does terrific job at expanding your vocabulary. The included audio CDs are useful for the listening section of the test. The accents on the CD are American. Your actual exam might be British, Australian, or American though. Barron’s Superpack is a more comprehensive prep than the official guide. The Cambridge IELTS 11 is a less comprehensive version of the Official Cambridge Guide to the IELTS. The book contains four authentic practice tests. But there are two versions of the book. An edition containing four tests for the Academic module or another for General Training. Both version have an introduction to these different modules though. The book’s highlight is a comprehensive section of tape scripts and answers. These include models and samples for all the writing tasks. Excellent for self study. Neither version is comprehensive on their own. But either is an excellent complements to other IELTS prep materials. Kaplan’s IELTS Premier is our favorite budget prep book for the IELTS. For around $15 you get a lot of practice opportunity. The guide includes 8 full length practice tests. 6 of which are for the Academic IELTS. And 2 for the General Training module. In total, that’s just over 900 practice questions. The questions quality is a little worse than the official questions. But they’re still excellent practice opportunity. About forty hours of prep material to work through. In addition to a CD with audio tracks, Kaplan includes access to their online repository. It’s got a few extra audio tracks. And more score reports, mock interviews, etc. Ace the IELTS author, Simone Braverman, is a former IELTS test taker. She’s written an easy to understand guide for the IELTS. Built around the hurdle she herself faced. Her goal is to reduce the time it takes to solve typical problems. Her tips, techniques, strategies, and advice focus on increasing task solving speed and efficiency. It does a great job in this regard and has gained much popularity. Ace the IELTS doesn’t include any full length sample IELTS tests. It’s a book designed to change the way you approach the IELTS. As such we don’t recommend it for the majority of test takers. Only for those that need to score in the higher band range (7 or 8). Cambridge’s Grammar for the IELTS book fills a long standing gap in IELTS prep material. Although the IELTS test doesn’t specifically test grammar it’s important for testing success. Other section skills are greatly improved with a strong grammar foundation. There’s coverage on all grammar points needed for IELTS here. The material’s presented through listening activities and various self discovery exercises. The exercises are especially useful in helping students retain the learned grammar. Illustrations fill each grammar unit and concept making the material easy to digest. Grammar usage explanations and examples are direct and clear. If you’re struggling with English, better grammar leads to across the board testing improvements.